Looking for a way to bring back more color in your RAW files? A way that’s easy, looks natural, and has no banding? There’s a way, and it’s built right into Lightroom and Adobe Camera RAW. It’s a bit of a secret and a hack. It’s called “camera calibration“. Camera calibration is of course intended to do just that, help calibrate your camera. But it’s also an EXCELLENT tool for extracting more color from your photos. The basic process is incredibly simple. Increase the saturation sliders found under red, green, and blue. Those saturation sliders are the key to the process, and really the only thing you need to know to get a lot of use out of Camera Calibration. You might expect they only target those colors, but they tend to have a fairly broad impact. That’s what helps keep the result natural looking and avoids banding. Of course, each one has a different result. It can be somewhat difficult to predict, so the best approach is to simply try each slider. Typically, the red slider is the most important for improving sunrise and sunset color. Green tends to help yellow tones. Increase each one until you see the result you are seeing. Be sure to look closely at small areas of saturated color, such as near the sun, to avoid overdoing it. Blue can also be very useful, but is probably the one where the most caution is needed. It is very easy to over-saturate blue in the sky, especially near the top or corners of the sky above the sun. An overly rich blue can quickly ruin the sky. If you find the blue slider is helpful in other colors, you can increase blue saturation and use an offsetting decrease of saturation in blue/aqua in the HSL panel. In addition to the saturation sliders, you might wish to try changing the profile from the default “Adobe Standard” to Camera Vivid. This increases saturation, but also makes shadows very dark. You will likely need to increase shadows and/or blacks in the Basic panel to compensate. There are other profiles, but I’ve never found them to be useful (the Camera Landscape profile tends to be too dark). In fact, most images should stick with Adobe Standard. They saturation sliders are the way to go. In addition to boosting color with the techniques above, Camera Calibration can also be used to change color. This isn’t something to use often, but it can be helpful to make adjustments. To adjust colors, use the hue sliders found under red, green, and blue. You can make an orange sunset seem more red by decreasing red/blue or increasing the green hue. Or make yellow leaves appear more green by increasing green/blue or decreasing the red hue. Experimentation is key. Take care to use small amounts. There is also a slider for shadow tint, to push your dark tones more green or purple. They can be helpful in a few niche scenarios, but this is a slider that most photographers can safely ignore. Note that Camera Calibration has a “Process Version” choice at the top. 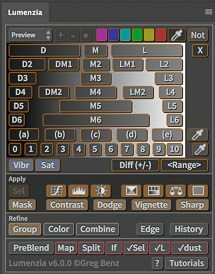 I recommend setting this to the latest (version 4), unless you are working with an old image and don’t want to bother tweaking the Basic tonal sliders. Version 1 and 2 are old, and have inferior highlight/shadow recovery, as well as a less capable clarity slider. Version 3 and 4 are essentially identical, with Version 4 adding the new “range masks”. They are so similar, that Lightroom will allow you to use Range Masks when using Version 3, and will automatically update the image to Version 4 if you use the range masks. See licensing for Commercial and Creative Commons (Non-Commercial, Attribution) Licensing terms. See my ethics and privacy statement.